British Prime Minister Theresa May says she asked the European Union on Wednesday to delay the country’s divorce from the bloc until June 30. “I have therefore this morning written to [European Council] president [Donald] Tusk, the president of the European Council, informing him that the U.K. seeks an extension to the Article 50 period until the 30th June,” she said. In response, Tusk gave a tentative greenlight to Britain’s request to delay Brexit — but said EU approval comes with a condition. 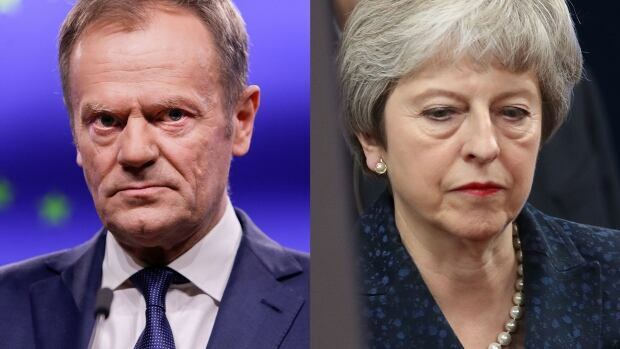 Tusk said Wednesday “that a short extension will be possible, but it will be conditional on a positive vote” in British Parliament on the Brexit agreement May reached with the EU. But a long extension would infuriate the pro-Brexit wing of May’s divided party and require Britain to participate in the late May election for the European Parliament. A delay to Britain’s withdrawal requires the approval of all 27 remaining EU countries, and France said the EU would not automatically grant it. “France’s position is simple: the British prime minister must explain to us for how long and what for, and offer us guarantees,” French government spokesperson Benjamin Griveaux told reporters. “A delay is therefore not automatic nor certain,” he said. Conversely, German Chancellor Angela Merkel’s spokesperson is welcoming the fact Britain has finally made a “clear request” about how to proceed on Brexit, but isn’t saying how Germany will respond. “We welcome the fact that there is now a clear request from Britain,” SteffenSeibert, Merkel’s spokesperson, told reporters in Berlin. Juncker, the head of the bloc’s executive branch said EU leaders are unlikely to agree to a delay at a summit this week.